Due to the constant fluctuation of the economy, individuals have decided to rather hold onto their savings and look for a more substantial investment. It is during these difficult times that investors have come to once again appreciate the value of physical commodities such as the value of investing in diamonds. CEO and Founder of Shimansky, a globally recognised diamond polishing and buying manufacturer, Yair Shimansky explains why diamond investment remains to be a reliable alternative. Before investing in a diamond it’s important to make sure the gemstone meets the minimum requirements. “Using the 4Cs as a guideline is considered to be very basic. It takes a lot more for a diamond to qualify as an investment diamond. For example, it’s a combination of characters such as the cut, polish, fluorescence, the way the inclusion is set in the diamond, the way the diamond is oriented in the process, its atomic structure; is it a type 1 A or a type 2 A, its overtones and overall grading” says Shimansky. Make sure to contact an expert for advice before purchasing an investment diamond. “A specialist will give you more information on the best investment strategy. For example, it’s like going to a financial planner. Ten different people will have ten different needs. Therefore, it’s considered very important to speak to an adviser,” he says. But where would one find a diamond investment specialist? 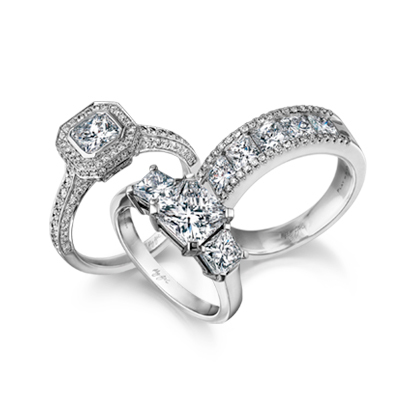 If you’re looking to invest in a diamond you can contact Shimansky directly, instead of visiting the retail store. “We will also be able to assist the investor at a later stage to resell the investment diamond if they’re planning to sell it,” says Shimansky. It’s important to know that retailers won’t be able to assist with investment diamonds; these diamonds are in a league of their own and not found easily at retail level. Therefore, an investor will require a specialist. When you invest in a diamond make sure it's reasonably close to the source price. This way, you will be able to resell the diamond at a later stage and still manage to make a profit. In addition, it’s highly recommended to avoid purchasing a diamond from a retailer. “If you purchase an investment diamond from a diamond expert, it usually means buying a diamond closer to the source. For example, a diamond will be mined, sorted, cut and polished, and sold to a manufacturer. From there, it will usually go to two or three other diamond dealers before it will go to a jeweller,” says Shimansky. Therefore, it’s better to purchase a diamond higher up the supply chain and eliminate additional profits or cost that were added on. The investment diamond should be graded by an independent third party, such as the Gemological Institute of America (GIA) before purchasing the gemstone. But, keep in mind, even though the diamond has a GIA certificate it doesn’t mean it’s the quality of an investment diamond. It's still considered to be very important to speak to a diamond expert, who will be able to tell you if the diamond has the minimum requirements and if it meets the Rapaport Specification 2+ quality standard. “Diamond investing is a highly specialised field with very few people actually understanding it. It’s definitely not something you would buy from a retailer or approach a retailer with, but rather an expert,” says Shimansky. There are many advantages when it comes to investing in a diamond. “A diamond is portable, there are no holding costs, the diamond’s value will never go down, it’s not affected by the Rand and Dollar fluctuation, you can appreciate it over time and it’s traceable,” says Shimansky. Investing in a diamond has been known to be a reliable alternative, especially during the highs and lows of the current economy. If you’re planning on investing in a diamond Shimansky suggests that you start with at least US $100 000 (roughly R1.3 million). This way, you would be able to receive the benefits of the diamond at a later stage. Also, it's important to ask yourself whether it's a long term or short term investment. “An investment diamond is an economy strategy; there is a vast difference if you hold onto it for 2-3 years or for 20+ years. In some cases, people want to buy an investment diamond and never sell it. All in all, there are many different strategies,” he says. Investing in a diamond remains to be a truly remarkable field, and therefore, a financial alternative worth investigating. Before deciding on investing in a diamond make sure to contact a diamond expert directly.